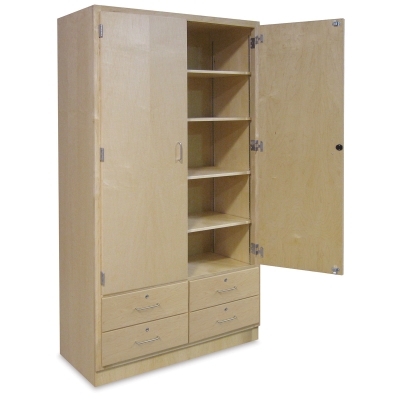 The heavy-duty Hann Tall Storage Cabinet with Drawers meets a wide range of storage needs. The spacious upper storage area has four adjustable full-length shelves (45"W × 19"D) so you can organize your supplies in whatever way best suits you. Below, four large lockable drawers offer secure storage. Each drawer measures 4½"H × 19¼"W × 19"D.
The Hann Tall Storage Cabinet is made of hard maple framing and panels with durable mortise-and-tenon construction. The cabinet measures 84"H × 48"W × 22"D.